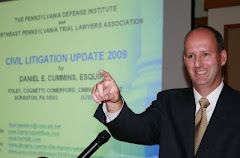 According to an April 8, 2010 Associated Press release, the United States Third Circuit Court of Appeals has upheld the insurance fraud conviction and 46-month prison sentence of former Pennsylvania Superior Court Judge, Michael Joyce. The three-judge panel from the Third Circuit Court of Appeals found that a jury could reasonably infer that the defendant meant to defraud Erie Insurance on the personal injury claims presented because of the defendant's "numerous exaggerations and misstatements" about neck and back injuries he allegedly suffered in an August 2001 automobile accident. According to the article, the former judge was convicted of mail fraud and money laundering in 2008 and sentenced in March of 2009 for collecting $440,000 in an allegedly low-speed accident during which his vehicle was rear-ended. The 61-year-old former judge has been serving his sentence during the appeal.